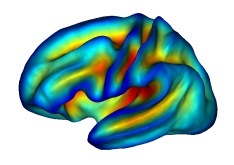 In order to have a reference surface for group studies, we built a surface template of the cortical surface. The HipHop138 template has been built by averaging the surfaces of 138 subjects after running the HipHop surface parameterization on these subjects. Both hemispheres have been processed separately. hiphop138_<L/R>white_<lat/lon>.gii → the corresponding longitude and latitude files that have been produced by the HipHop parameterization process. hiphop138_<L/R>white_parcels_marsAtlas.gii → the corresponding parcellations produced by the MarsAtlas parcellation process. hiphop138_<L/R>white_spherical.gii → spherical versions of each hemisphere. These are needed to compute the correspondence between any subject’s cortical surface and the template. hiphop138_<L/R>_pole_cingular.gii -> a mask of the cingular pole for each hemisphere. 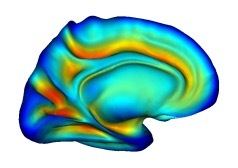 Mesh and sulci extraction, and sulci automatic labelling performed using the Morphologist pipeline (BrainVisa 4.4).